The west Norfolk parish of Watlington is situated north of Runcton Holme. Its name comes from the Old English for ‘settlement of Wacol’s people’, ‘wacol’ meaning ‘watchful’. Setting aside prehistoric but otherwise undateable objects, the earliest evidence of human activity comes in the form of a Mesolithic flint blade (NHER 39457). Neolithic finds include a stone axehead (NHER 2269), a flint axehead (NHER 14936) and a flint scraper (NHER 18879). No Bronze Age objects have been recovered to date, but analysis of aerial photographs has tentatively identified the cropmarks of several ring ditches (NHER 11724), the ploughed-out remains of Bronze Age round barrows. On Sixty Acre Field in the same area, a preliminary assessment in 2003 in advance of aggregate extraction revealed a large area of complex archaeological remains (NHER 39458). The majority of features dated from the Iron Age and Roman periods, and indicate that this was the location of an Iron Age and Roman settlement comprising ditched enclosures, trackways, pits and post-built structures. 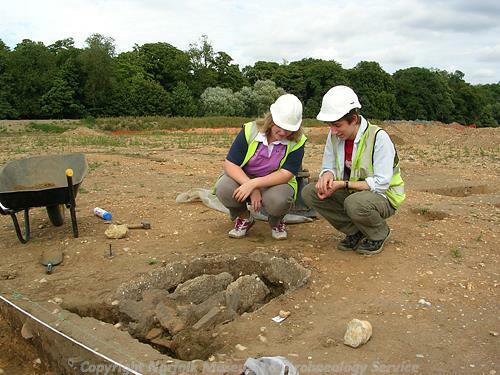 A Late Iron Age mortuary enclosure containing a cremation was also excavated. Roman objects recovered to date include coins (NHER 11724, 25341, 31072 and 31435), brooches (NHER 25341 and 31345) and a hair pin (NHER 31072). An evaluation of land straddling the border with Tottenhill in 2003 revealed evidence for Roman and Saxon activity (NHER 39457). A large curvilinear ditch, also visible on aerial photographs, was excavated and found to contain 1st to 3rd century pottery. Ditches and gullies to the north and northwest of the site appeared to comprise a field system of similar date to the enclosure. Several pits containing smelting slag and possible Saxon pottery beside a rectilinear enclosure suggested a probable metal-working area in the northwest corner of the site dating from the Saxon period. Saxon finds elsewhere in the parish include Middle (NHER 11724 and 39458) and Late (NHER 23605) Saxon pottery fragments. The medieval period has left the parish with its oldest surviving building, the church of St Peter and St Paul (NHER 2286). This is a pretty church, almost entirely built of carstone, consisting of a west tower, aisled nave with a clerestorey, a large chancel and a south porch. A masonry church of Norman date certainly stood on the site, as evidenced by re-used material, and it is quite possible that the base of the tower remains from this period. What is now the second stage of the tower dates from the 13th century. In about 1300 a major rebuilding scheme took place, when the present belfry was added to the tower, the nave rebuilt with aisles, the south porch added and the chancel and tower arches inserted. We do not know anything much about the pre 14th century appearance of the chapel other than the insertion of the arch, but in about 1340 it was given a new set of windows. North of the chancel stood a sacristy, now lost, though on the outside wall its aumbrey and piscina can still be seen. In the 15th century the tower was given a new west window, a set of pinnacles, a small spire (now gone) and a brick stair turret, though this might be a later 16th century addition. At this time the nave roof was removed and replaced by a clerestory with a lower nave roof and separate aisle roofs. Restoration took place in 1900 to 1902. The gently Victorianised interior has many medieval survivals, including fine carved bench ends of several of the Seven Deadly Sins, a rood screen and a 15th century font with figures of the Apostles, rather vandalised in the mid 16th century. The font cover dates to 1620 and has a later gilt swan or pelican on top. Also to be seen are very good 15th and 16th century memorials. 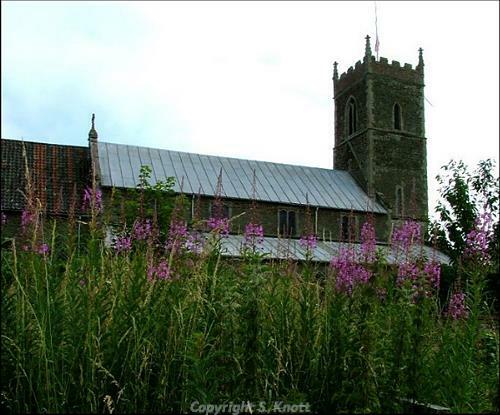 The tower has six bells, two dating back to 1450, the others to 1910.These were restored in the late 1990s. The clock in the tower dates to 1920, and was given in thanks for the return of soldiers after World War One. Other medieval buildings have not survived but have left traces of their surrounding moats as evidence of their former presence. East of Downham Road is the remaining north arm of a medieval moated site (NHER 2283), the other arms having been infilled. The Rectory on the central platform is Georgian, possibly encasing an earlier timber framed house. Many medieval objects have been recovered, selected examples including pottery fragments (NHER 23038, 23039, 23054 and 23599), coins (NHER 25341, 25492, 31009 and 31435), brooches (NHER 31009 and 25341), a horse harness pendant (NHER 31009), a pilgrim bottle (NHER 31435) and a buckle decorated with a winged dragon (NHER 31072). Of the post medieval buildings to survive, probably the earliest is Church Farmhouse, also known as The Old Manor House (NHER 20421) on Lynn Road. This is a mid 17th century modified H plan brick house, two storeys high with an attic and a pantiled roof. The porch, door and windows are all 19th to 20th century insertions. The mid 17th century brick garden walls are on ashlar plinths with square sectioned gatepiers supporting ball finials. To the northeast of the parish is Hall Park (NHER 31972), a late 18th century historic parkland. It was a pleasure grounds by 1839 with isolated stables and a kitchen garden. Plantations were established around edge of the park by 1869 and lodges erected at the ends of the east and west drives by 1885. There is no public access to the park and the available information is very limited. The present hall (NHER 2279) dates to about 1940, when it was rebuilt after a fire. The age of the previous hall is not known, but it is marked on a map of 1797. 33 Downham road (NHER 47073) is a late 18th century two storey brick house, T-shaped in plan, with 19th century additions, including the façade. The East Anglian Railway (NHER 13594), originally known as the Lynn and Ely Line, runs north to south through the parish. It was opened in October 1847 and is still in use. The most historically recent entry on the record is a World War Two pillbox (NHER 35923) that still stands to the south of Church Road. Aerial photographs taken in 1946 show the earthworks of an anti-aircraft or searchlight battery in the same area. P. Aldridge (NLA), 9 August 2007.